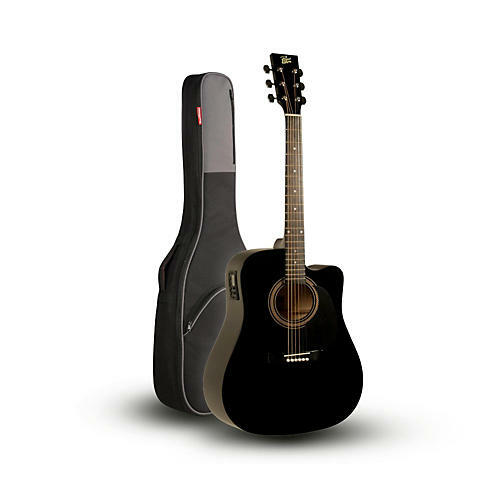 The super-affordable Rogue RA-090 Concert Acoustic-Electric Guitar is an excellent entry-level 25.4" scale guitar with laminate whitewood body and top finished off by a natural black gloss to keep it in peak condition for years. Other features include a single cutaway, nato C-shaped neck, simulated rosewood fingerboard, simulated belly bridge, and an ivory color plastic saddle and nut. Rounding out its fabulous features is an Eden MET-A06 undersaddle pickup system with 3-band EQ and tuner. Includes a RR1AG gig bag. If full-time protection and value are important to you, whether at home or around the neighborhood, Road Runner’s Avenue Series RR1AG Acoustic Guitar Padded Gig Bag is the ideal solution. Perfect for defending your gear against in-home accidents as well as light-travel nicks, scuffs and scratches, the Avenue Series RR1AG takes overall gear protection as seriously as you do. Rugged, weather-resistant exterior withstands local cartage from your home to rehearsals, practice, jams or lessons, and reinforced interior panels protect wear prone areas from bridges and machine heads. You’ll also find external pockets for sheet music, mobile tablets, cables, straps and more, and an exterior bottom rubber guard for extra floor-to-instrument protection.